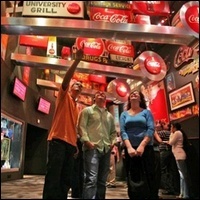 World of Coca-Cola at Pemberton Place celebrated its Grand Opening on May 24, 2007. It's the only place where you can explore the complete story — past, present and future — of the world's best-known brand. With 60,000 square feet to explore, World of Coca-Cola features more than 1,200 artifacts from around the world that have never been displayed to the public before. Parking: There is a parking deck located between World of Coca-Cola and the Georgia Aquarium that can be used for visitors to both attractions for $10. MARTA: Visitors can take the Blue/Green Line to the Dome/GWCC/Philips Arena/CNN Center Station or the Red/Gold Line to the Peachtree Center Station. It is about a 10-minute walk from either station. From the Dome/GWCC/Philips Arena/CNN Center station, walk south on Phillips Drive and turn left at Centennial Olympic Park Drive. Turn left at Baker Street to reach the destination. From the Peachtree Center Station, walk west on Andrew Young International Boulevard. Turn right at Centennial Olympic Park Drive and left on Baker Street to reach the destination.